I think that is a wonderful way to welcome the day - and to end it. I think we should give thanks for our beautiful days - beginning and end. I have been consciously enjoying my environment lately - your posts keeps me on track. these are good routines. we need to be more thankful. more reflective. Your photos are so good at capturing mood as well as image. Such intriquing textures too ... perhaps it's time I got more adventurous. Happy Birthday for yesterday. Now that's a routine I could get used to! A beautiful routine, perfect really. You know, I really like both of these. Perfect! Your day looks like a day I'd love to be a part of! The pool shot is so wonderful! 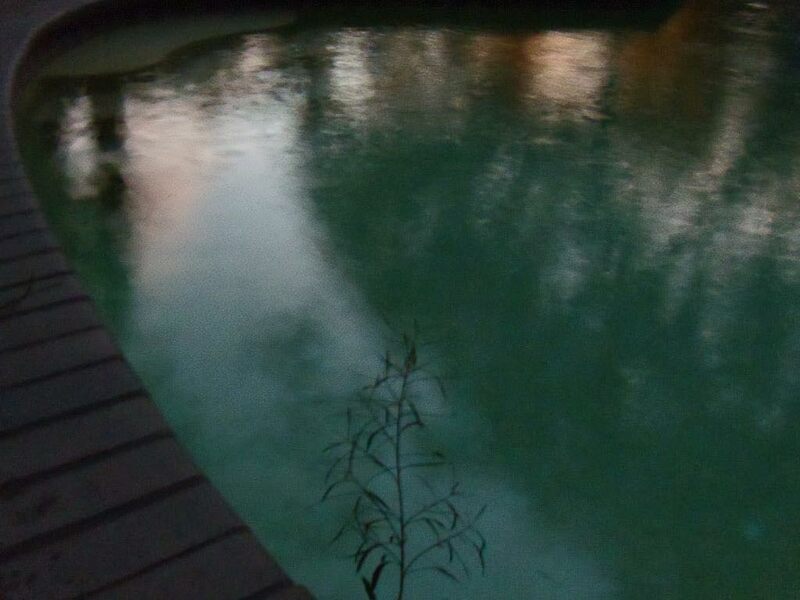 I love the darkness of the morning captured in it, the blue/greens of the pool, the plant growing, the light of the day beginning to reflect off the water! routines are a very good thing ! That is a wonderful routine. Yes, yes, I love this. So often I grouch through the morning. I should be thankful for the day. I hereby vow to do better. Oh those colors are magnificent. Love it love it love it. You have a way of making me feel relaxed and at ease in this creative space. What a gorgeous pool! I love that shadow photo! such beautiful routines, filled with shadows and light. pauses filling my sweet day. a practice worth the keeping. Beautiful colors in both photos and a dreamy softness. I especially like the colors in the water on the first and the texturing in the 2nd. At first I thought you added texture but I think not now. Both lovely with a lovely sentiment. We should take at least a few moments daily to be grateful for what we are given but we usually don't (me included). what a wonderful beginning and end to your day. hope your weekend is grand. i LOVE the second photo! it looks like a painting!! Yes! wonderful rituals beautifully depicted. the last is gorgeous. I recieved your package, they are as beautiful as I imagined they'd be. Beautiful, wonderful day!! Love it, and being thankful is such a great way to be! I love day break, when my kids get older i promise myself to enjoy it more. What a wonderful exercise in gratitude. Oh, you do know how to live. And so grateful for the coffee and for the wine! Celebrating life's simple moments for 52 years! The comfort of routine is something I love too--especially in the mornings to start the day. :o) I love the almost abstract quality of these scenes today, Elk. Happy Day! 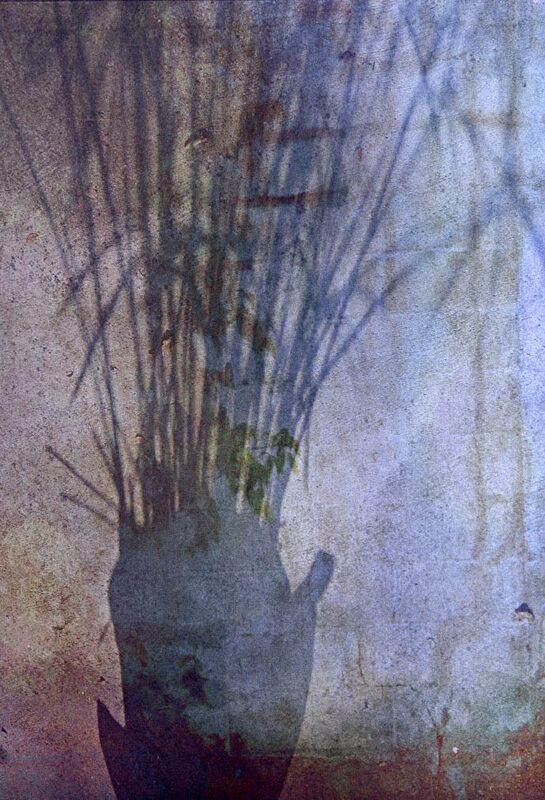 Your shadow picture so captures the peace at the end of the day as all living creatures ready themselves for the night. I so love to sit quietly at our pond with a glass of wine at exactly this point! So peaceful - would love to dip my toes in that water! Beautiful...love how abstract and painterly they are. What a lovely couple of rituals. A positive way to start and coonclude the day! what a great ritual for beginning and end. I love the shadow. We can love the shadows, right?